Easily dispense cold refreshments for a crowd with this Plastic Mason Jar Style Beverage Dispenser from Lily's Home. 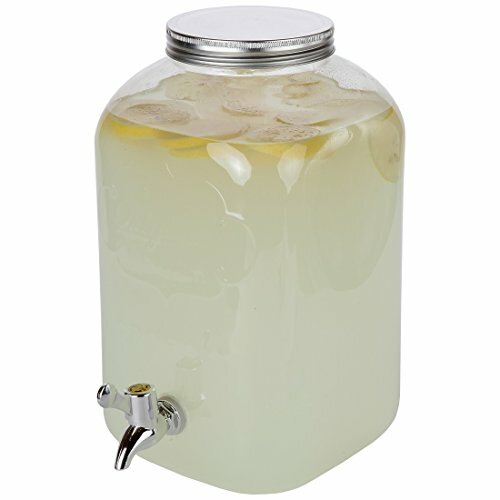 Ice cold water, lemonade, iced tea and juice all stay cool and refreshing in this oversized dispenser container. You can even use it for mixed drinks such as margaritas or mimosas! The clear plastic keeps drinks on display and the tin, Mason jar style tin lid can be removed for easy washing, refilling and emptying. It is constructed from BPA-free plastic that is safe for all beverages, and won't shatter if dropped. This dispenser measures 12.9" tall, 9.2" wide, and 7.2" deep, and holds up to 2 gallons of your favorite cold refreshments. Your bbq or party guests can use the spigot to dispense drinks without the need to tip, pour or spill. Just what you need for indoor meetings or outdoor pool parties and picnics. Lily's Home makes a wide array of products for every home and garden lover. Whether you're looking for a perfect gift to spruce up your friend's garden, or if you need a housewarming present, Lily's Home has something for everyone! IDEAL BEVERAGE DISPENSER: Lily's Home plastic Mason jar beverage dispenser has an easy-to-use spigot for dispensing drinks. This drink dispenser is constructed from thick, premium grade BPA-free plastic material that ensures stability and balance when in use indoors or outdoors. The dispenser is unbreakable and safe for use with all cold beverages. TIN SCREW OFF LID: This beverage dispensing jar has a large diameter mouth so it is easy to add lot's of ice cubes and or fruits. It is perfect for large crowds at indoor or outdoor parties, BBQ events, or at home for everyday water dispensing use. LARGE CAPACITY FOR BIG PARTIES: Each beverage dispenser holds up to 2 gallons of cold liquids that can quench the thirst of even the largest crowds. Pick one up for your next family get-together! FOR INDOOR OR OUTDOOR USE: You can use this jar inside or outside the home to keep water or other drinks cool in the fridge. Take it along on picnics for that extra special touch. Please only use with cold beverages, and do not put freeze or place in direct sunlight.